Have you just completed your registration with your professional body in an English speaking country? Or do you frequently receive international patients in your own country as tourism in healthcare increases? Have you been feeling obligated to learn and communicate in English since it became the language of science, technology, commerce and art due to such a fast globalization? If that is so, this book is your first aid kit,take it! Do you receive difficult patients? Do you experience prejudice at work? Does the competition in your team complicate even the simplest situations? This book will show you how to use language effectively to overcome all challenging people and situations,through many real life scenarios. Do not blame yourself, do not blame your colleagues, do not blame your patients, do not blame life! That can only narrow your world which can only be widened through your language. Remember what Wittgenstein said:”Limits of my language are the limits of my world.”. This book gives you opportunity to broaden your language, gain communication skills and become master of any situation not the victim. Read it and smash it! Let your world have no limit! When you are good, your patient is already better, when you are better, your patient has already 50% recovered. Smile and speak perfect Medical English to simplify all complications! 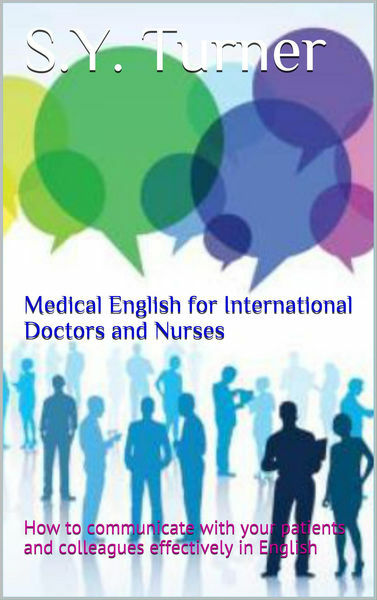 Doctors, English, International, Medical, Nurses permalink.